Warranty Trend Reports, hinder or help? What are the benefits of regularly reviewing the warranty trend report? Is there any benefit to the dealership, besides the obvious of avoiding a manufacture audit, in reviewing a warranty trend report? Can I actually use it as a tool to help my business? Or is it just a negative part of being a franchise and created to save the factory money at the dealerships expense? My hope is to demonstrate how there are some unintended benefits from taking an honest examination of your warranty processing trend that may actually help you create a better, more profitable service department. 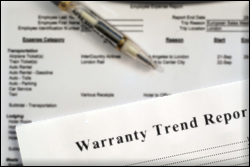 Warranty trend reports were originally designed in part to help the manufacturer pinpoint areas in which product quality was an issue. Now they have taken an enormous turn around to analyzing the dealer's warranty administration and business practices. Many dealers are faced with an "unfavorable" warranty trend report leading quite often to costly warranty audits and reviews. In fact, some dealers are changing their warranty administration by playing the "hold the claim game" or in some cases going as far as "eating claims" in order to avoid manufacturer harassment. We have all been told that warranty processing dollars were going away and dealers were told to beef up the customer pay work to compensate for the loss of revenue. At first, many technicians were pleased to hear that the manufactures were going to be building better vehicles that would last through the warranty period, creating a higher customer pay work mix. However, warranty volume has been cut drastically. It has been cut primarily in the reimbursement of labor times, and part prices of commonly replaced parts. As a result the industry has actually seen an exodus of technicians from the field. However, do not be too discouraged. The reality is technicians need to be more educated than in the past as it is becoming more and more a high tech diagnostic and part replacing position. These guys have to be sharp, and when you get a good one, they are hard to keep! For many years warranty was considered a valid large percentage of the service departments income. It was common to see shops warranty sales reach levels as high as 65%. As the manufacturer realized the revenue that it was costing, just on pure sloppiness alone, they decided it was time to start holding the dealers responsible for some of these deficiencies. Long gone are the days that the tech with the sharpest pencil goes home with the fatest paycheck. In one dealership some years ago we teased the "top dog" technician of being the dealer principles "neighbor". Service managers would declare, "Don't give him any of the garbage work, he is my best producer," and so started the "tail wagging the dog" era for technicians. With dealers depending now more than ever on the service department to turn a profit, the department must run like a fine oiled machine, the last thing they need is to be afraid to ask for what they have coming to them. It is time to change our way of thinking about how these reports affect us! Let?s first take a look at the obvious - service department operations which you can potentially control. Assuming that the warranty report is a fair comparison between your dealership and other "like" dealerships, you need to ask the question, "why is my dealership different?" If it is a matter of policy rather than administration then you should want to find out the core reasons your shop is different. Whether you realize it or not, if policies are resulting in over-charges for the factory, they are most likely doing the same thing to your customer pay work by following the same business practices. For example, a customer's car was a drop off, and all that was communicated to the advisor was "hard start at times". The tech is given the vehicle for "repair" in which he runs a basic computerized diagnosis and road test, gives it back to the customer with "unable to confirm" or "no problem found". Oh yes, and of course a bill for $125.00. You know the rest of the scenario - customer returns again (if you are lucky) upset at the dealership, and who knows how many visits it will take to rectify the problem. If this were handled properly, the advisor would have asked up front, or at least the customer would have been called and asked some questions such as "when this occurs is it warm or cold on these hard starts? Is it damp outside? Can we keep the vehicle overnight if necessary?" And so on. Just as in any team sport it all starts with good fundamentals. Most importantly of all, your people must be professional, polite, and even-tempered, even in the heat of the battle. Good customer instincts are a must. Sounds simple, but it is amazing how many shops under perform in this key area. Over the years we have performed hundreds of warranty reviews and reports for many different dealers and at least 80% of the time, it boils down to this - a lack of structure, demonstrated by a lack of sound policies and employee accountability. Here are some great tips to follow that will not only help you lower warranty expense, but should help you build customer satisfaction resulting in better over all returns. Write up. Schedule an appointment for write up. Give the customer time to help you "experience" the issue they have with their vehicle. If it is a problem that requires a road test or a cold start, whatever it takes, make all necessary arrangements to produce the experience the customer is concerned about so you know you are addressing the same issue. And be as accurate as possible on the write up to the technician so they clearly understand as well. Do a walk around on the vehicle noting any damage in a way that doesn't seem like you don't trust them. Training and shop loading. Be sure your techs are trained in the area of the work you are scheduling them for, and that you are not overloading them. Many manufactures will not pay a claim in certain repair categories unless a tech is certified in the area of repair. If you start guessing and throwing parts on the vehicle, this will obviously have a huge impact on your numbers. Communicate with the customer once you have the car. Let them know when to expect the vehicle to be completed. We all know that quite often the day does not go as planned. You may need parts, or have some other roadblock. When this happens, a pro-active call to the customer is most certainly appreciated so they can arrange their day accordingly. Communicate with your service team. Be sure you review repair history, run a manufacturer's stat report showing warranty info, open recalls, etc. Be sure you have a "repeat repair" process in place, which will address if the vehicle has been in for the same or a simular complaint. You also should make it clear to the customer what is warranty and what is customer pay. Keep control of your shop. If your technician is having trouble diagnosing or just getting it repaired, be sure you are aware so you or the manufacturer can get involved before too much time and money is spent. These are just a few common processes that may help to reduce your warranty expense. Unfortunately, most weaknesses in procedure go unseen, until some outside pressure forces the shop to take an honest evaluation. If your dealership has an unusual work mix that is causing an imbalance in the factory report, you should review that work and determine if those imbalances are purposeful or unintentional. High volumes of repairs in certain groups like fleets, farm vehicles, or specially built vehicles, etc. 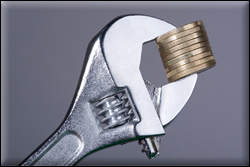 may not only adversely affect your warranty trend; it may affect your overall profitability. This past year we have seen a huge change in the way large trucks affect trend reports. Especially, when the dealer belongs to a metropolitan market. Not all manufacturers understand that variations do in fact influence the warranty trend. For example, lets take a manufacturer that is having troubles with diesel trucks, however their cars have been improving. If you were servicing a lot of diesels in 2007, your numbers would have been high. Until recent weeks when the factory finally accepted the reality, that expensive diesel claims were unbalancing trend reports, your shop?s warranty report would have benefited from actually turning away diesel work (obviously not good business practice and many shops were actually doing this). While the other dealer that "picked up" the business, in hopes to gain a new customer, was likely to get punished. Finally, you must take a look at your administration. If you are not coding claims properly, submitting them on a timely basis, or grouping them properly, it can certainly have a big impact on your warranty trend. Many times pressure from flat rate mechanics can cause in-house warranty administrators to bend the rules and get the dealer in trouble. Many dealers use a third party that is trained in reading trend reports to guide them in areas of concern, while processing claims timely and properly, removing a large portion of that concern without putting all their eggs into one basket. The big problem with doing your own analysis is that it is truly difficult to look at your business or department objectively. Lets face it, some of the most successful business men and woman in the world know that if they want an honest objective opinion of how their operation is running, they need to go to the outside to get it. Go to the professionals. To sum it up, review your warranty trend reports regularly. Keep an open mind; you may learn something about your business. Make a structured plan to train your advisors and technicians according to the outline above or something similar. Work with a professional outside warranty processing company that is trained to process the claims properly and help you evaluate the "why" in your warranty trend. 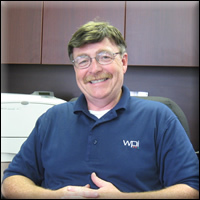 Stephen Reiter is president of Warranty Processing Inc.